Tearing apart the new GDP report. Fourth-quarter GDP growth was revised down Friday, to 2.8% from an original 3.2%. Don't worry. This stuff happens all the time. Almost every GDP report is revised, and it's usually down. What do the new numbers tell us about the economy? Still with me? Good. You're one of the few who enjoys this stuff. Now let's dig into the details. The 2.88% contribution from consumer spending can't be ignored. It's simply huge. Consumer spending's contribution to GDP last quarter was the highest since early 2006. To put the 2.88% in perspective, the average contribution since 1990 is 1.92%; since 2000, it's 1.56%. All this backs up the idea that the American consumer is back in the saddle -- we're spending again! But like the rest of the economy, the spending is split. One consumer group is doing really well and spending with abandon, and another is still hurting. Low-end retailers like Wal-Mart (NYSE: WMT) are stuck in an environment still very much recessionary. During Wal-Mart's third-quarter conference call, Bill Simon, president of the company's U.S. operations, talked about how customers continue to "struggle in the current economy," and noted that "compared to last year, traffic decreased and the average ticket was down slightly." In terms of price stratification, we continued to see bifurcated performance, with declines in sales and transactions below $500, but double-digit percentage increases in most every other higher price category, indicating to us the diverging effects to one degree or another that the economy is having on consumer spending. Whatever the mix, total consumer spending is up and looks sustainable. Go ahead. Rejoice. Now it's onto gross private investment, which clobbered GDP growth. The culprit: changes in business inventories, which alone reduced growth by 3.7%. This wasn't surprising. Early in the recovery, changes in inventories were almost singlehandedly driving GDP growth as retailers restocked shelves after liquidating merchandise during the recession. With restocking leveling out, the quarterly growth rate has reversed. Totally foreseeable. 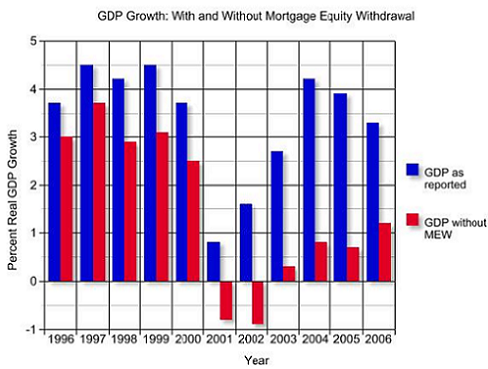 Also foreseeable but depressing: residential real estate construction not contributing to GDP. No one's building homes. There are too many left over from the boom. It could take years for excess inventory to clear out. That could be a problem. A few weeks ago, the House Budget Committee asked Fed Chairman Ben Bernanke if there was any historical precedent for the economy recovering without housing and construction. He paused. Looked around. Looked puzzled. Finally came his answer. "It's normal for housing and construction to be an important part of the recovery." No, in other words. It's going to be hard to get the economy humming sustainably without a pickup in residential real estate. And by most accounts, that could take a while. Years. Exports in December were the strongest in two years. A couple of factors are driving this. One is that other global economies are booming. Latin America. China. These folks are growing strong, and have a healthy appetite for the stuff we make. Second, a weak dollar makes our goods more attractive to everyone else. The result: Total exports were up over 11% last year. Exports to China, up 25%. Mexico, up 32%. A year ago, central banks around the world were printing money in an attempt to cheapen their currencies and increase exports. With that came the wisecrack that, as USA TODAY put it, "not every nation can export its way to economic recovery." True. But we are. Sorry everyone else. We're loving it. It's good for our economy, and even better for companies like Caterpillar (NYSE: CAT), which last fall expected 2010 exports to rise over 65% from the year before. Let's hope it lasts. Thoughts? Share 'em in the comment section below.